The combination of the first two can sometimes be a little odd. There are many ways in which the Jewish culture stuck, though the belief system never took hold at all. I love Passover seders, for instance, especially if I can be irreverent about them (more about that in a few weeks). I look forward to certain traditional foods (while at the same time relishing shellfish and anything related to pork). That sort of thing. One favourite food has always been Hamantashen: triangular pastries associated with the Jewish festival of Purim, filled with poppy-seed paste or fruit filling (prune, cherry, apricot, or raspberry, usually). They’re little hand-held, individual fruit pies, and well-made ones are true delights. It’s Purim now (well, this past weekend), and the Hamantashen are in the air. 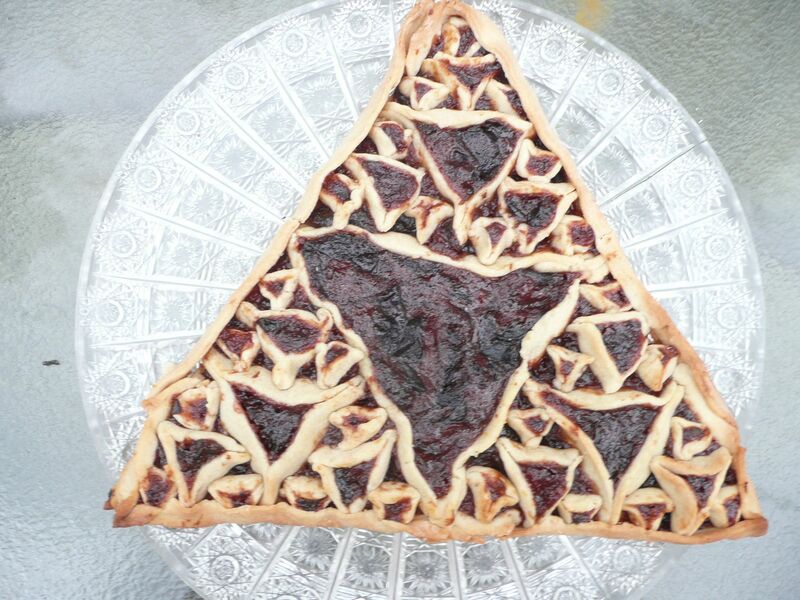 And Seattle food blogger Deborah Gardner has tied it all in with the math-geek bit to make the ultimate Hamantash (that’s the correct singular; Hamantashen is plural (I’m a language geek, too, remember)): the Sierpinski Hamantash, modeled on the Sierpinski triangle. I can't resist chiming in that my daughter just waxed lyrical about hamentaschen on her (*excellent*) blog, too, and posted her sister ("Aunt Genocide")'s amazing recipe -- Check it out here! Combine #1 and #2 with being a ham...and you end up being really confusing. Brent: ar-ar-ar. Yes, we certainly had our share of "kosher ham" jokes when I was a teen.